So who d’ya like for the playoffs this year? Are you rooting for the Google Goliaths or the Microsoft Maulers? Me, I’m betting on the Intel Invaders over the Texas Instruments Titans. I heard the spread is 128 bits. As embedded systems get smarter and more connected, the “Internet of Things” could easily become more than a marketing buzz phrase. We already have self-driving cars, auto-piloted drones, and robotic vacuum cleaners. How long before we pit them against one another? It’s said that first automobile race was held shortly after they invented the second car. Why not have robots compete against each other? And not the human-operated “robots,” exoskeletons, or radio-controlled mobile explosives that we occasionally see on TV today. I mean real, autonomous robots that manage their own strategy and tactics. Personally, I think that would be pretty cool. I’d set my TiVo to record that. They don’t have to be destructive, either. We could have autonomous stick-and-ball sports, not just metallic gladiators. “Auto” racing (har, har) might be cool: Set a dozen autonomous vehicles on a track and watch ’em take off. 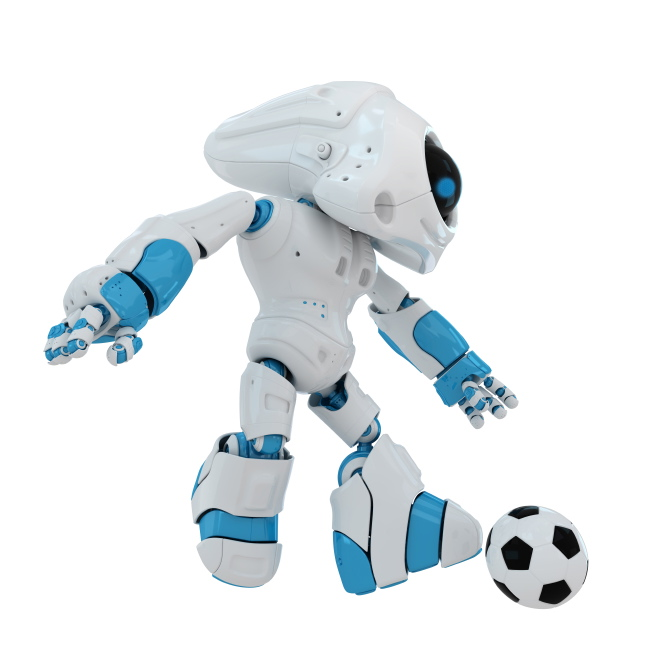 I’m sure we’d invent entirely new sports before long, as we think up challenges for our robotic sports stars. High jump over an electric wire? Accuracy steeplechase? Laser archery? Or how about mechanical hide and seek, with four-ton machines ducking behind rocks and climbing trees? Better yet, have a team of smaller automatons compete against one large opponent for bragging rights. Can a swarm of smaller devices, armed with GPS, laser range finders, and a cooperative, distributed mesh network zero in on a larger and more integrated opponent? Or will the behemoth crush the weaklings – perhaps literally? Robotic sports might give students an interesting incentive to enter the fields of engineering, programming, physics, or mathematics. Instead of learning to create smartphone apps or programming database algorithms, CSEE candidates could be building up their alma mater’s sports team. Engineers would replace athletes as the public stars of the school. And, unlike most football players, they’d actually graduate with a useful skill. But would it play in Peoria? Sure, engineering students might follow r-sports closely, but would your average Joe Sixpack care? I think so. The late ABS Sports producer, Roone Arledge, said the key to getting audiences engaged in sports is to always have a local angle. That’s why players’ home towns and college affiliation are almost always displayed; it allows faraway audiences to relate to an otherwise anonymous and ever-changing team lineup. Without that, nobody in Montana would watch a game between two Eastern teams. Similarly, robotic teams can be college-affiliated (at the amateur level) or sponsored by well-known brands (at the pro level), which isn’t too different from how professional sports work today. We’d take the Apple-versus-Windows battle to a whole new level. Plus, we’d have real Androids. What purpose would r-sports serve? What purpose does any sport serve? We don’t play (or more likely, watch) football in order to find the world’s best passer, receiver, or field-goal kicker. We don’t apply baseball as a filter to locate the world’s best ball-throwing talent or base-running champion. This isn’t Sparta. We’re not training athletes in order to toughen up soldiers. All sports are fundamentally pointless exercises designed solely for entertainment. We invent a set of arbitrary rules, we generate meaningless tribal conflict – Beat LA! – and we root for obscenely overpaid players we’ve never met and a team whose only real association with us is based solely on its proximity to our current residence or its association with some previously attended institute of higher learning. Or because we like the mascot. Go Beavers! So instead of tuning in to cheer for the latest Cuban-born-pitcher-turned-Seattle-hometown-hero-du-jour, we’d applaud for C-3PO. Is that so wrong? The spinoff technology could be great. With a whole new market for engineering talent and innovation, combined with an intensely competitive atmosphere and the time and money constraints of operating a team, we’d hatch a whole generation of practical (mostly) technology. Vision systems, high-speed wireless networks, cryptography, anti-hacking technology (would hacking be allowed by the rules? ), motion control, stealth technology, auto-guidance, collision-detection and -avoidance (or -assistance? ), as well as plenty of other areas would all benefit. It’d be like the DARPA Grand Challenge, but less militaristic and more profitable. Let’s turn embedded engineering into a spectator sport. But more importantly, let’s make it into a participatory sport, too. Put me in, coach. I’m ready to play.